Alas, it is the end of another field season and I am writing this from my home in New Jersey, two nights and two hot showers after leaving Tiputini. Here’s a smattering of thoughts and events from the past few weeks. 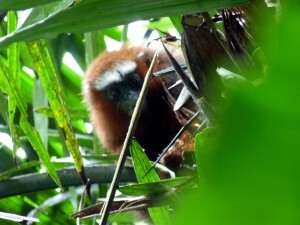 I arrived at Tiputini hoping to understand a little more about the behavior and ecology of lowland woolly monkeys. Instead, it has been a remarkably confusing field season. My main mission over the past month was to track the movements of the different woolly monkey groups at Tiputini and to collect genetic samples opportunistically for future analysis. Our main tool for tracking monkeys is radiotelemetry, the use of remote technologies to collect information. In our case, we use radio receivers to “listen in” on certain radiocollar-equipped monkeys. Out of the eight or so social groups that we know of, eight individuals are radiocollared representing six groups. 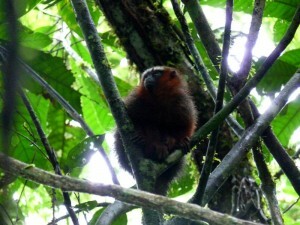 From past experience, we have had the sense that woolly monkey group ranges overlap tremendously and that monkeys from different groups rarely aggressively defend their home ranges. As a result, groups occasionally occupy the same area simultaneously and uneventfully. This complicates data collection tremendously and causes us to be especially careful when tracking groups, as the presence of a certain individual and a strong radio signal does not necessarily indicate that the individual belongs to the same group as the radiocollared monkey. 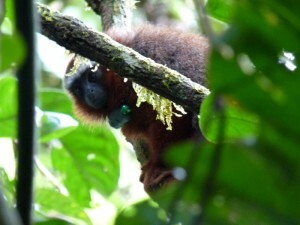 Furthermore, woolly monkey groups are frequently very spread out, even beyond the range of our telemetry equipment. 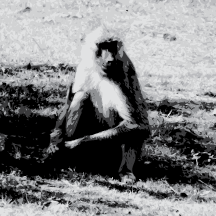 The absence of a radio signal in the presence of a monkey is therefore common and provides very little information. On one of my final days with woolly monkeys, I followed a group (group I) for an entire day without receiving a signal from any of the eight radiocollars and never leaving the known range of one of our better-known woolly monkey groups. Possible conclusions, therefore, are that  I followed group I but the radiocollars were not functioning,  I followed group I but it was so spread out that the two individuals with collars never entered the range of my telemetry equipment,  I followed an unstudied group whose range overlaps with that group I, and  my telemetry equipment was not functioning and/or I screwed something up. I can’t rule out any of the four possibilities. Altogether, very confusing but that’s what makes it intriguing (or so we tell ourselves). I also had the chance to take ranging data on some of the radiocollared groups for which we have less information. Surprisingly (or perhaps not surprisingly), the monkeys led me to areas not known to be within their home ranges and overlapping significantly with the home ranges of other groups. On one occasion, I followed a group (group G) well outside of their known range and into the Harpia Plot, one of the two 1 km x 1 km plots here at the station. I lost track of time and was still deep within the plot by the time it got dark (around 6pm). Within 15 minutes, it was pitch black and I was still off-trail when it started to rain. As I was beating my way through tangles with my headlamp on and trying to get a bearing with my compass, I started to worry that Tony and the others would never find me as they had no idea that group G spends time in the Harpia Plot. I survived. 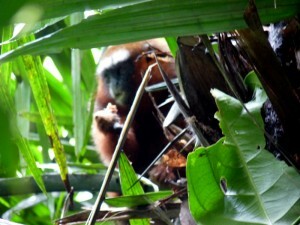 After a day of settling in at home, I miss the rainforest terribly. Before I left for Ecuador, I told everyone who would listen that I wanted to go to Tiputini because I didn’t know whether I would have the chance to return to Neotropical rainforest. I know better now. I’ll be back. Great blog- Sounds like you had a terrific field season! Good luck in St. Louis!